Catholic Charities of South Carolina Piedmont Region will be opening a Client Choice Wellness Food Pantry this summer to serve those who are located in a food desert and have little to no access to fresh fruit and vegetables. The pantry will be located in the San Souci area of Greenville where it will serve over 3100 households within a 2 mile radius that are currently living below the Federal Poverty Level. 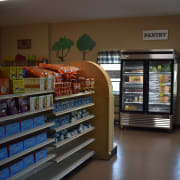 The Pantry will not only address the food needs, but will also serve as an entry point to other critical services that will assist them in working towards self-sufficiency. Volunteers will work with clients on intake, shopping assistance, pantry operation, stocking shelves, healthy eating choices. Volunteers will aslo serve as Community Services Specialists that will strive to assist persons and families in the surrounding communities with a plan of wellness and lifestyle change.